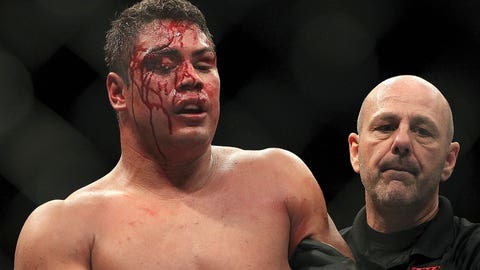 Late UFC heavyweight Shane Del Rosario’s system contained several illegal drugs, however, the Orange County, CA coroner's office ruled out the substances as the 'underlying cause' of death. Cocaine was found in the system of late UFC heavyweight Shane Del Rosario after he suffered cardiac arrest last month, according to his death certificate. The causes of death listed on the document were a lack of oxygen to the brain, an abnormal heart rhythm associated with heart attacks and a congenital heart disorder. But there were other contributing factors — cocaine, opiates and THC were all found in the 30-year-old’s body. FOX Sports confirmed the information with the Orange County (Calif.) coroner’s office Friday. MMA Junkie was the first to report it. The certificate was issued Wednesday. Anoxic encephalopathy, ventricular fibrillation and Long QT syndrome were the official causes of death, according to the certificate. The drugs were "other significant conditions contributing to death but not resulting in the underlying cause." The drugs were ‘other significant conditions contributing to death but not resulting in the underlying cause’. Daniel Aikin, the Orange County supervising deputy coroner, told FOX Sports that all those conclusions, including the presence of drugs in Del Rosario’s system, were come to by doctors at Hoag Memorial Presbyterian Hospital. No autopsy was performed by his office. Though Del Rosario’s death was not announced until Dec. 9, records show that he actually died Dec. 3. That was the day that neurologists at Hoag pronounced him brain dead, Aikin said. Del Rosario’s family wished to keep him on life support following that pronouncement. Del Rosario suffered sudden cardiac arrest Nov. 26. He was found in his home by roommate Ian McCall, a fellow UFC fighter, and rushed to the hospital.